This story is so very, very familiar to us that I think it’s important to look at it with a fresh perspective. So in this post I am including some pieces from media and the arts that force us to think about Genesis 22. I promise you in advance that some of these might be disturbing to you. Probably you will disagree with the portrayal of Abraham’s sacrifice in at least one, if not all, of these pieces. I hope you will share your reactions in the comments. One of my favorite poems juxtaposes the story of Abraham with World War I. The poet, Wilfred Owen, is a tragic figure himself, who was gunned down at age 25 just seven days before the Armistice on November 4, 1918. This poem invites the reader to consider the effects of extreme religious devotion. Does this type of yielding and vulnerable submission make you more comfortable than the more fanatic type? Why or why not? Now let’s explore what would happen if Abraham did decide to think for himself — to take a critical look at what God was asking him to do. What if that were God’s purpose behind the lesson, after all? This short story comes from the Fob Bible, which I own and I highly recommend. It is called “Abraham’s Purgatory,” and was written by Ben Christensen. I included the lithograph below by Salvador Dali because I think it is interesting how the Abraham and Isaac figures are so small and how the focus of the work is the angel. It dominates the picture and brings to mind the sacred nature of the sacrificial story. Dali’s angel is not an insipid, white robed choir boy. We see the figure from the back and it is both awe-inspiring, unknowable, and a bit frightening. As you watch the following comedic sketch, ask yourself the question: “Is it easier to do something God asks if you want to do it anyway?” How much personal interpretation comes into play when we are deciphering God’s will? Jewish Midrash suggests that it was difficult to dissuade Abraham from the act of sacrificial violence once he had decided to kill his son. The Midrash reads: “…and he said: Lay not thy hand upon the lad. Where was the knife? Tears had fallen from the angels upon it and dissolved it.” It was the tears of the angels, not those of Abraham that dissolved the knife. Yet, even after seeing the knife dissolve, Abraham is unconvinced and persists with the violence. “’Then I will strangle him,’ said he [Abraham] to Him. ‘Lay not thy hand upon the lad,’ was the reply. ‘Let us bring forth a drop of blood from him,’ he pleaded.” Abraham refuses to be deterred. His unaffected and immediate suggestion of an alternative method of sacrifice is shocking. Some may consider this to be steadfast piety, but the violent undertone stands in stark contrast with the Midrashim that emphasize piety over violence. After that method is refused, he then pleads if he may bring forth a drop of blood from his son. The use of the word “pleads” would lead one to assume that Abraham’s plea to G-d was an emotional one. The emotion, it seems, stems more so from an inability to sacrifice his son than from G-d’s request that the sacrifice be made. 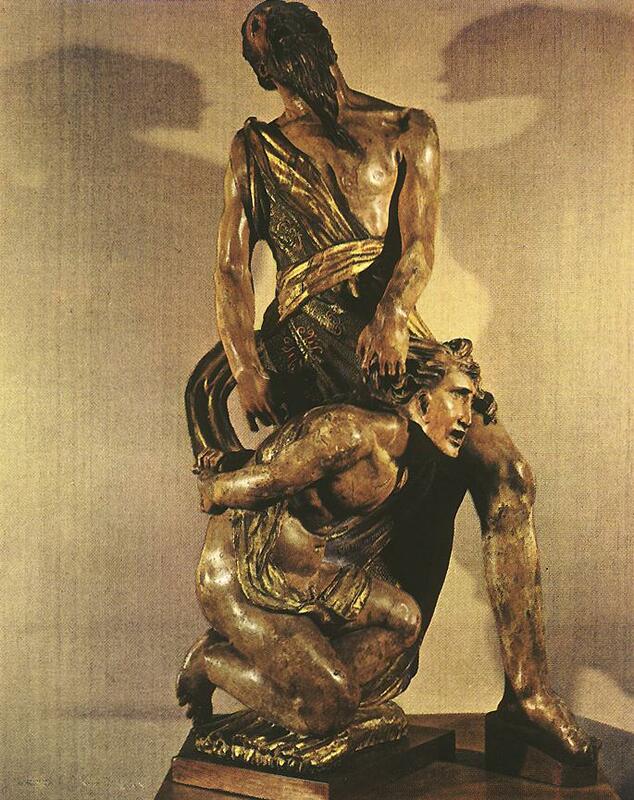 The sculpture below by Berruguete is included for its portrayal of the human emotion on the faces of Abraham and Isaac. You will probably hear in your Sunday School lesson the idea that Isaac was a youth in his prime at the time of the sacrifice, while Abraham was an old man. This interpretation promotes the idea that Isaac was a willing participant in the act of submission to God. The sculpture visually portrays this idea, picturing Isaac as a strong and virile young man, capable of wresting himself free from his bonds. Though horrified and frightened, he is kneeling and complaisant. The final piece of media I would like to include for your consideration is a biblical canticle written by Benjamin Britten. During this two-person opera, one singer assumes the role of Abraham while the other takes that of Isaac. Through the homophony of the two singers, God’s voice emerges as if it were a third solo singer. The use of the older tenor and the younger alto voices in the vignette below to sing the words of God is very moving. Upon that hill there beside thee. For aught that may befall. As they sing “Abraham,” the notes are first discordant, then resolve, aptly representing the theme of the story. The story of Abraham and Isaac is a powerful one. It is the most dramatic moment in the life of one of the most important of the Biblical prophets. I think that its inclusion in the Bible is meant to be disturbing and to evoke turmoil and discomfort. I hope that the Sunday School portrayal of this section of the scriptural record will not be too soft and fluffy. The canticle was exquisite. Thank you. This is a wonderful post, BiV. I think it is especially poignant to me because when I married, I prayed to know if I should marry him before I was even attracted to him (and that’s a story of its own.) As I got to know him better, I continued having doubts, explaining them away as common cold feet. In reality, those doubts were harbingers of my future life. Had I been willing to listen to the new information God was trying to share with me, I may have avoided a great deal of painful experience. Had Abraham not been willing to accept further light and knowledge from the Lord, he would have killed his only covenant son for nothing. Oh, Ron. That was extremely wrenching. I’ll simply have to watch the whole thing. Thank you for adding yet another nuance to this discussion. I was unfamiliar with the Britten Canticle – but the musical setting was quite familiar, as Britten used the very same musical materials for his setting of the Wilfred Owen poem cited above in the “War Requiem.” I’ll have to check out the Canticle – but if any of you found the Canticle grabbed you, then you simply must check out the Britten “War Requiem” – but be sure to set aside some quality time where you can concentrate on it and follow along with the texts and read any included commentary notes. Of course, a lot has been made of the parallelism between the Abraham/Isaac account and the crucifixion of Christ. Once while teaching an “Abraham Lesson” in my ward’s high priest group, I was stunned when it became apparent that none of the brethren present had ever heard that angle. Yes, of course. And yet it is my opinion (Girardian influenced of course) that it was not required that Jesus be killed anymore than it was required that Isaac be killed. It is not God’s will that we kill his Son. It is OUR will. Our choice. We kill our Gods and call it God’s will. We are the stone throwers. If we do not kill our God when He comes then the Kingdom Comes. This is mystery that has been “Hidden from the Foundation of the Earth” —we kill our Gods and it is not God’s will that we do. The miracle is that God resurrected His son and in so doing His son’s life and teachings and ways are vindicated with that sign and token—so that perhaps the next time he comes we do not do it again and call it His will (see Dosteovsky’s wonderful chapter called “The Grand Inquisitor”. And, of course, you have to read The Scrolls, Woody Allen’s exposition on the Abraham/Isaac story. That’s very odd. In the SS manual this is in fact the stated purpose of the lesson — “to help class members better understand Heavenly Father’s sacrifice in offering his Son as they learn of Abraham’s willingness to sacrifice Isaac.” Interestingly, although Abraham represents God in this story, Isaac does not represent Jesus, but rather US, the sinner who would merit spiritual death were it not for the substitution of the ram (Christ). Sam #9–No! I hadn’t seen the Woody Allen one, but it fits right in here. “some men will follow any order no matter how asinine as long as it comes from a resonant, well-modulated voice.” = one thing we really do have to guard against in the Church! interesting post and comments so far. I have real problems with this story, and wrote about it on my blog a while back. what bothers me about the background – human sacrifice was a very common form of worship not only in abraham’s day, but as late as Jeremiah. a rabbi from the 10th century said abraham’s imagination led him to think he should sacrifice his son, and it was the angel who really said human sacrifice was wrong. some scholars believe this story is a repudiation of human sacrifice and was added near the days of jeremiah to show the israelites it was not what god wanted. my favorite quote from this rabbi is ‘how could god command such a revolting thing’? mh, give us a link to your post, please! You got me thinking about how, as we grow older, we sometimes return to the ways of our childhood, or at least, we look back at them with fondness. As I think about it this way, the Abraham story can portray the patriarch looking back on the religious fervor of his father and wanting to duplicate this. We need to find a way to continue righteous traditions and motivations without perpetuating the evil ones. That may be what the Jewish midrashim had in mind. I am always saddened by the fact that more Mormons have not read Sören Kierkegaard’s Fear and Trembling. It is the most remarkable, challenging, honest, and enjoyable treatments of this story. The questions of if there is an absolute duty to God, and if there is a teleological suspension of the ethical are beautifully treated. Yet they are also disturbing in that they shed an honest light on faith today and what it means. I think its fairly evident (specifically in the context of terrorism justified in the name of religious fundamentalism that includes everything from killing doctors to blowing up buildings etc) that we are now in a place where most of us have a hard time accepting the possibility of there being a divine suspension of the ethical, since we are seeing just how destructive the result of such a suspension becomes. Yet, at the same time, for faith to be fully formed, shouldn’t believe in a way so as not to set limits upon divine volition? I think so, even thought I find it impossible to live that that kind of resignation to the will of God. I think the first video clip in the OP is quite funny but its also an insult to Abraham and the richness of the story. The truth of the story is not the Sunday school version that tells a one dimensional story of Abraham’s great faith (rather than his resignation), nor is Abraham the kind of fool who can’t understand the ethical dimension of what he sets out to do, as the video portrays. Let us imagine Abraham as a fully developed ethical human being and prophet what was asked to do the unimaginable. This is the truest test of agency in which a decision is impossible yet, he can’t not decide. He will either become a murderer in resigning himself to God’s will, or he will disobey God. How can he survive such a conflict in tact? What’s interesting is that when human agency comes in contact with the divine of the OT, we often find that the human is asked to do the impossible. Its never a choice between good and evil, its about making a decision in a context where no decision can possibly satisfy the demands of the various aspects of our faith, our desire, and our understanding of God. This quote is false; in that in taking the actions he did, making the decision he did, must be seen as causing great emotional suffering for Abraham. Divine mercy may have spared the life of Issac but it does not sooth the emotional trauma Abraham went through in resigning himself to God’s will, and deciding to murder his son. There is a level of cruelty here that can not be overlooked. Listen to this sermon of the Abraham and Isaac story by Robert Krulwich of NPR given at his synagogue. It is very moving, but also very disturbing. I would of course not put limits on divine wisdom — on the idea that God probably understands the contours of the natural moral law better than I do. But I believe that placing limits on divine volition — that is, positing a God whose volition is irrevocably intertwined with moral law, such that He could not act contrary to the law without ceasing to be God — is the only way for faith to be a rational choice at all. Only by positing a God who is unconditionally for humanity, do you have any clear means of identifying the starting point: If we hope for God’s favor, including a revelation of the Truth, because God loves us, then if there are any conditions to obtaining God’s favor, they involve loving each other and loving the Truth. But if God can lie (because to say that he could not lie would place limits on his volition), or ordain objective evil because it is His sovereign pleasure, then God is a capricious God, and we have no promise that our diligent search for him will bear fruit. We could seek Truth and serve each other all day long, and if God could just blow us off, then why bother? My blog’s heading picture shows a composite of two telescopic pictures of different regions of space. The “alpha” side of the picture shows entire solar systems being created in their thousands; the “omega” side of the picture shows entire solar systems being destroyed in their thousands. You can’t logically involve God in the “alpha” without involving Him in the “omega” as well. Indeed, sometimes acts of creation and acts of destruction are the SAME action. While I don’t for a minute believe God is capricious, things like those pictures make me doubt that I understand enough to claim my understandings of good or evil are objective, or that God won’t slay those He loves. I think your comment is a great summary of what we might call the Greek understanding of how God works and the conditions under which he is thought to exist. But the story of Abraham comes from a Hebrew lineage, which did (does?) not have the same concern for rationality. I love the distinction that Herbert Dryfus makes (and that I repeat often) between the Greek and the Hebrew when he asks, “Does God command something because its good, or is something good because God commands it?” That is such a nice summary of two different understandings of God. Now, I don’t think the Hebrew tradition, or myself, or Dryfus are advocating for an understanding of a capricious God. (That kind of ontology is obviously beyond us anyway.) But to circle back to SK, he would say its a matter of how resigned to God’s will we are, even to the point of it suspending the ethical. So there is not reconciliation possible between these two views of God and between rational faith and resignation to God’s will, yet they co-exist in Christianity broadly, and in Mormon thought as well. Within Mormon thought I think its interesting to see how we often tend to be Greek today, but Joseph Smith tended towards the Hebrew. At least in his words, it not his actions. This is another reason to enjoy the story of Abraham, it really pushes us in an uncomfortable way, directly asks where the limits of our faith (or resignation) lie. Frankly, it’s all Greek to me. Or at least more Greek than Hebrew. So is the New Testament, or at least the Pauline part. Jerusalem needs at least a little Athens, or it’s just another (albeit well-refined) roast-goat-reeking oriental mysticism. Joseph Smith may have taken his branch of Christianity in a Hebrew-ward direction, but not even his theology can’t be read as simply “Something is good [solely] because God commands it.” See Alma 42:13: “Now the work of justice could not be destroyed; if so, God would cease to be God.” C.S. Lewis, similarly, wrote of a “deeper magic” that was co-eternal (and presumably co-equal) with God, which God Himself could not break. The notion of an absolutely sovereign God, whose volition is unlimited — the God of Islam, who “is not bound even by his own word, and that nothing would oblige him to reveal the truth to us…[w]ere it God’s will, we would even have to practice idolatry” — is not the God of the Gospel. If there exists even a theoretical scenario where the exercise of God’s volition — for instance, a decision to ignore the requirements of justice — would cause God to cease to be God, then there are limits on God’s volition. Even the often-maligned statement by Joseph Smith (for which he is criticized as being a kind of moral relativist: “Whatever God commands is right, no matter what it is, although we may not see the reason thereof till long after the events transpire…” is consistent with this. It’s not that God creates morality as he goes along, by his mere dictate. Rather, if God seems to ordain immorality, this is because of the imperfection of our moral understanding, which it is suggested will eventually be clarified so that we can see that God’s commandment was morally right all along. In short (and although I will definitely have to do more than read the Wikipedia article on Fear and Trembling), in the end, I can’t fathom the idea of treating “suspending the ethical” as being a part of resignation to God’s will. To me, the former is an essential part of the latter, inseparable and indivisible. I love God because God is good, and can’t conceive of a good reason to love (or care much about one way or the other) any other kind of God. I used to love Kierkegaard’s masterful explanation or apologia of the indefensible but the historical reality of rampant human sacrifice in ancient Israel as well as the analysis that Girard and others bring to the table make Kierkegaard’s analysis seem a bit wanting. It’s not an issue of “my understandings.” While I hope to conform my understanding of good and evil to those things’ objective reality, insofar as it’s within my poor power to do it, of course I will see the truth only in part. What I object to, is the notion that objective good and evil ought not to matter one way or the other — that even if I had perfect knowledge that a thing were evil, I ought to do it if I had perfect knowledge that God commanded it. At that point, if the scriptures have it right, God would have ceased to be God. Obedience would cease to be honorable, and become mere servility. And that would not be an eternal state worth striving for. I can concur with your above statement. I think where we may differ is that LDS theology, if I understand it, sees God and moral law as separate and that God remains God because He always obeys it. I believe that God and moral law are two names for the same thing, so the “cease to be God” scripture is more rhetorical than an actual possibility in the first place. By anology, one does not break the law of gravity and suffer the consequences; one cannot break the law of gracity in the first place because the “law” is a description of how reality works. FT — I think we agree pretty much completely. Does LDS theology see God and moral law as separate? I don’t know. I’ve read some things that suggest that God and eternal law are co-existent and co-eternal, which starts blurring any real lines that may exist between them. In any event, beyond a few main points, LDS theology is extremely fluid, so whether God is defined as separate from or united with eternal law may depend more on which faction’s champions are married into the family of the then-current Prophet than anything else. BiV, I wanted to share that link, but I was typing on my phone and it was impossible at the time. But now that I have a computer, here are some Muslim, Jewish, and Academic perspectives on Abraham. I guess it is interesting to me that Walter Zanger claims Abraham wasn’t a monotheist–only that Abraham believed the Jewish God was supreme. It could be that Abraham was trying to sacrifice Isaac (or Ishmael, as Muslims believe) to a pagan deity, but the Jewish God stepped in to stop the sacrifice. I love some quotes from rabbis. There are some radically different views of the slaughter (sacrifice) of Isaac. # The early rabbinic Midrash Genesis Rabbah imagines God as saying “I never considered telling Abraham to slaughter Isaac (using the Hebrew root letters for “slaughter”, not “sacrifice”)”. # Rabbi Yona Ibn Janach (Spain, 11th century) wrote that God demanded only a symbolic sacrifice. # In some later Jewish writings, most notably those of the Hasidic masters, the theology of a “divine test” is rejected, and the sacrifice of Isaac is interpreted as a “punishment” for Abraham’s earlier “mistreatment” of Ishmael, his elder son, whom he expelled from his household at the request of his wife, Sarah. According to this view, Abraham failed to show compassion for his son, so God punished him by ostensibly failing to show compassion for Abraham’s son. This is a somewhat flawed theory, however, since the Bible says that God agreed with Sarah, and it was only at His insistence that Abraham actually had Ishmael leave. # In The Last Trial, Shalom Spiegel argues that these commentators were interpreting the Biblical narration as an implicit rebuke against Christianity’s claim that God would sacrifice His own son. I was hoping Andrew S would stop by. He had some real problems with Kierkegaard, and I think I tend to go along with Andrew. He left a few comments at my blog on Kierkegaard. Kierkegaard might have some problems I have to concur that Fear and Trembling is one of the most insightful and challenging books of faith that I have read. Moreover, it is short. I think Douglas is spot on with his recommendation that we should all at least be familiar with it. Keep in mind that I am not arguing one way or the other, I’m just pointing out that both these intellectual trends coexist within Christianity and that reconciling them is not really possible. Your project is clear. You are going to interpret everything as being essentially Greek because that is what you are comfortable with. That’s fine, but I think its a mistake to insist upon such a project as being an ontologicaly accurate conception about the nature of Christianity or Mormonism. Is it just me or is this a tad bit offensive? OR what’s wrong exactly with mysticism reeking or otherwise? Without mysticism Mormonism would look a lot different. There is a level of nuance here that we need to keep in mind. The kind of divide I am describing may strike some as odd, its not that case that the Greek has no room for that which exceeds reason, or that the Hebrew rejects reason completely, the boundaries are fluid in some ways, and not always easy to pin down. Specifically for those of us who live now. Joseph Smith was very often Hebrew but depending on the day he could be very Greek as well. But that’s fitting isn’t it. He was after all, a post-enlightenment Christian who placed tremendous emphasis on the Hebrew. What else would we expect from him? What I tend to look at is when he was really trying to press the case for a specific doctrine or idea what side of him did we see? This does not provide a consistent answer but it does show how he made arguments concerning theodicy for instance. I can imagine it as a necessary part of resignation, if that is what one seeks. I can’t imagine it as part of my faith, as I wrote in my initial comment. The question is what does this limit tell us? I think it tells me something about my faith, but very little about God. It does not speak to his nature or will in any way. #26: ““Jerusalem needs at least a little Athens, or it’s just another (albeit well-refined) roast-goat-reeking oriental mysticism. I believe that the beauty of Christian faith owes much to its fusing the diverse currents of faith and reason. Fides et ratio, if you’re a Catholic; “by study and also by faith” in the Mormon formulation. Naked mysticism, untempered by reason, gets you the heathen in his blindness bowing down to wood and stone, in the 1950 hymnal’s memorable words. You can surely overdo the Greek stuff, as some of the early Church fathers did in their Neoplatonist aversion to physical matter, which manifested as disgust with the idea that God could have a physical body (which Joseph Smith reacted against) and in the Augustinian horror of sexuality (which he didn’t react against quite as much). But overdo the mysticism, and there’s really not much to distinguish you from the witch doctor smeared with elephant dung or the priests in the temples of Baal. I suppose courtesy demands we restrain ourselves at least somewhat, but courtesy cannot rob honest judgment, nay, not one whit. When I see a Creationist museum with dioramas of little plastic knights riding dinosaurs (Cabazon, CA), I’m going to laugh my head off, courtesy be hanged. I have read the many Wikipedia article on Fear and Trembling, in the end, I can’t fathom the idea of treating “suspending the ethical” as being a part of resignation to God’s will. To me, the former is an essential part of the latter, inseparable and indivisible. I love God because God is good, and can’t conceive of a good reason to love.